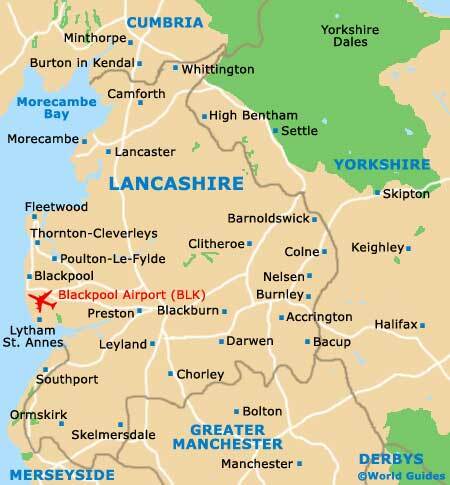 To the south of Lancashire are those two great English cities of Liverpool and Manchester, while to the north is the Lake District. The Irish Sea lies to the west, and eastwards is the mountainous backbone of northern England, the Pennines. Lancashire has it all, then, from fantastic scenery and seaside resorts to gritty towns and villages that still bear many signs of their industrial past. The boldest and brassiest of Lancashire's seaside towns is Blackpool, home of the famous Tower with its ballroom and organ, and also known for its Pleasure Beach theme park and annual seafront illuminations. Blackpool exudes traditional seaside fun. There are shops selling buckets and spades, old-fashioned piers, a tram that trundles along the promenade, amusement arcades and even donkey rides on the golden sands. It has managed to remain popular and today is one of the most visited towns in England. Those that prefer a holiday that is more leisurely and refined tend to head to nearby Morecambe. Preston might be the administrative centre of Lancashire, but the town of Lancaster retains its title of county town in all other senses. Lancaster's Castle was once used to incarcerate the accused during the Pendle Witch Trial of 1612. The infamous witch hunter Thomas Covell stayed in town during the proceedings in what are now the Judges' Lodgings. Lancashire's industrial past still gives some parts of the county a gritty feel. During the Industrial Revolution, factories emerged all over Lancashire, particularly in towns like Accrington, Burnley and Oldham. There were once hundreds of mill towns and collieries, and by the mid-19th century, over three-quarters of the world's cotton was processed here. A vestige of those days of heavy industry is Lancashire hotpot, a meaty but thrifty dish topped with sliced potatoes, which regularly features on many a pub menu. For those who've overindulged and need to walk off a few hotpot-laden calories, there is always a chance to stretch your legs in the Forest of Bowland, a beautiful area of unspoiled gritstone fells and moorland in the north-east of Lancashire. Blackpool retains its popularity as one of the UK's leading beach resorts and competes favourably with many top budget destinations throughout Europe. Those coming to Blackpool can expect traditional seaside fun and fast roller coasters.